To all activists and supporters. Check out this very useful resource on www.rangzen.net/resources/maps/, created and regularly updated by our Rangzen chowkidar. It is a series of professional quality maps which provide accurate and thorough information on self-immolations, protests and other crucial events. 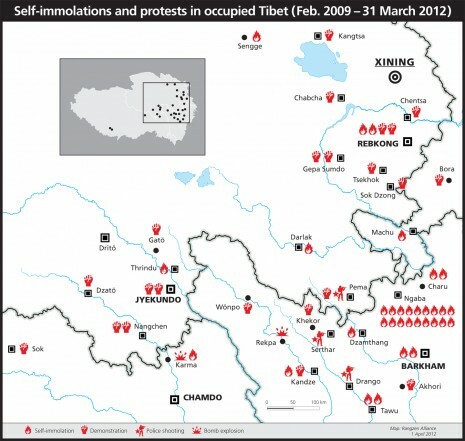 If you are a teacher developing an assignment for your classroom on recent events in Tibet, or if you have a lecture on the self-immolations, feel free to download and use the maps for your presentations. If you know any journalists or other media person covering Tibet do refer them to this link. The maps comes in Tibetan, English and Chinese versions. Outstanding resource on this sad but necessary topic. Will get this distributed to our area schools. It would be great if Tibetan educators or educators-in-training could take advantage of these maps to develop some teaching units on the current situation…something that could be distributed to any interested schools abroad. Dealing with the issue of physical self-sacrifice, for example, in western middle and high school curriculum can be sensitive, but some examples of how this has been dealt with before can be found in existing units on the Holocaust, and also some of the Vietnam teaching units which discuss the monks’ self-immolations there. We non-Tibetans can get to work on cover letters and curriculum ideas, of course, and should; but ideally we could end up with something that is at least mostly written from the Tibetan perspective. I don’t mean to over-emphasize the Jewish connection, but how many Tibetan “Ann Franks” are there, for example? Hundreds? Thousands? These types of personal stories, through childrens’ eyes, are very powerful in the elementary ed classroom. It may feel as if western schools already have a fair and balanced view of Tibet, or are even pro-Tibet, but the sad reality is that in almost every American history or geography classroom there is a gigantic world map on the wall with the word “China” firmly planted over Tibet. Over time, the word “China” has migrated, on published maps, steadily westward. One reason I like the maps provided by JN here is that, when shown in the classrooms, students may immediately ask, “Why are all the trouble spots over there in the east? Isn’t Tibet more to the west?” and start that whole conversation. If any educators are here and are interested in working on a curriculum unit or two, using the above maps, I’d definitely be willing to offer time and labor, or at least distribution. I think Wisconsin schools would be very receptive, since we are in the thick of dealing with other rights issues here at the moment. Thank you so much for all the hard work, passion, meaningful skills you have put forward to allow us know these facts.